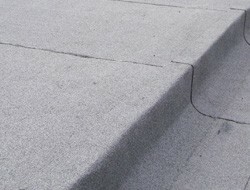 Offering great affordability and simple installation, built up felt is a fantastic choice for your flat roof. You may be weighing up the options for your flat roof and are considering felt. Rest assured that our years of experience ensures that we can fit and, if so required, repair felt roofs swiftly and affordably. We like to deliver a quick, professional service to all our customers in the Leicester area, regardless of the scale of the job. Our free quotation service commences with a visit to your home, where we’ll listen to what needs doing, take a look at the job site and then give you your quote. We’d love to hear from you, so get in touch by calling 0116 316 9544. Don’t settle for a roofer that only carries out shoddy work that needs quickly replacing. Use the area's professionals to get the job done right. You’ll get a tidy finish, and you’ll enjoy our courteous service throughout. For built-up felt roofing call today, wherever you are in Leicester.